What can go wrong with your liver? What are the symptoms of liver disease? How is liver disease usually treated? How has Liver Dr. helped others? How do I use Liver Dr? The liver is found within the lower part of the rib-cage on the right hand side of the body. It has a huge variety of functions in the body and is the only organ that can repair and re-grow itself after damage. The liver is the second largest organ in the body and is often seen as the most important one. In traditional Chinese medicine, for example, a healthy liver is seen as the most critical element in the body's ability to fight disease and function optimally. For this reason, complimentary and holistic medicine always emphasizes liver health as one of the most vital components in overall systemic health. Amongst other important functions, the liver is responsible for eliminating and detoxifying the poisons that enter our blood stream. It is very important in the digestion of food and produces bile which is essential in the breakdown of fats, thereby preventing obesity – one of the biggest contributors to ill health. It also regulates blood sugar and stores any excess sugar in a useful “quick-release” form for when it is needed. The liver clears the blood of old red blood cells, bacteria and other infectious organisms as well as ingested toxins including alcohol. It is responsible for producing a large number of different proteins including hormones and blood clotting factors and is the organ which stores Vitamin A, D, E and K.
Environmental pollution, fast foods, drugs, alcohol and sedentary lifestyles all contribute to sluggish and diseased livers. The result? Depressed immune systems, constant fatigue, obesity, sluggish livers and digestive systems, allergies, respiratory ailments, unhealthy skin and many other health problems. As with all organs of the body, the liver is subject to a range of disorders and diseases. The liver’s functioning does not really decrease with age so, in the absence of disease, the liver should work optimally right into very old age. Sometimes liver functioning becomes compromised due to lifestyle factors (e.g. diet, alcohol abuse) or due to side effects associated with medication. Symptoms of a sluggish liver include depressed immune systems, constant fatigue, obesity, sluggish digestive systems, allergies, respiratory ailments, unhealthy skin, irritability and many other health problems. The commonest diseases affecting the liver are viral hepatitis and alcoholic liver disease. Hepatitis A, B and C are the commonest causes of viral hepatitis. Although Hepatitis A is usually a transient infection, both Hepatitis B and C can be serious and progress to chronic liver disease, even causing liver cirrhosis or liver cancer. There are usually very few warning signs until liver damage is far advanced. Liver Cirrhosis can be due to any long-term, continuous cause of liver damage. These causes include alcohol excess, Hepatitis B and C and inherited liver disease. When the liver is damaged some of the functioning cells die and are replaced by scar tissue. Once cirrhosis has developed, the process cannot be reversed even if the underlying cause improves. Alcoholic liver disease does not affect everyone who drinks alcohol. Though it is dependant on the amount of alcohol drunk over time, some people seem to be more susceptible to the adverse effects of alcoholic beverages. Consistent heavy alcohol intake can cause a condition called fatty liver in which the liver cells become filled with fat. It can also cause alcoholic hepatitis (Inflammation of the liver) or cirrhosis. There are a number of laboratory tests that may be done to establish liver disease. Commonly, enzymes produced by the liver when it is damaged are measured in order to see if the levels are raised. Bilirubin - a breakdown product of destroyed red blood cells may also be measured as well as proteins produced by the liver such as albumin and blood clotting factors. Effective drug treatment of liver disease is very limited and is often restricted to treating the symptoms and preventing complications. Treatment will depend on the specific condition. Commonly used medications are anti-viral drugs for viral hepatitis, steroids for auto-immune disorders and iron-removing or copper-removing medications in the inherited disorders hemochromatosis and Wilson’s disease respectively. Medications that cause very unpleasant and even dangerous side-effects when combined with alcohol, are commonly used to try and keep people who are dependant on alcohol from drinking. In people taking anti-viral drugs, which are used to prevent virus replication in Hepatitis B and C, relapse is common once the drug has been discontinued. People with liver disease or dysfunction need to be very careful about the drugs they choose to take as many common prescription and over-the-counter drugs can be toxic to the liver and severely worsen the condition and functioning of this important organ. In extreme and irreversible cases of liver damage such as liver failure due to cirrhosis, liver transplant is the only long-term effective therapy. If ignored or left untreated, many liver diseases will lead to permanent and irreversible damage to the liver and can be a significant threat to your health. Liver problems respond well to a holistic approach, including complementary medicine, avoidance of alcohol, drugs and other toxins as well as a healthy diet. These measures can prevent organ damage, improve liver functioning and ward off irreversible changes due to toxins. As the treatment options in the allopathic medical world are very limited and liver transplants are uncommon, a holistic approach to liver dysfunction and disease is your best chance of keeping this vital organ healthy and functioning well into old age. In the ‘old days’ people used to say that they were ‘feeling liverish’ to describe a feeling of being bloated, uncomfortable, slightly nauseous, lacking in energy and generally ‘out of sorts’. Liver tonics were more widely used than they are today – with good effect! At Feelgood Health, we recognize the vital importance of liver health – for quality of life and wellbeing as well as for the treatment of liver disease and dysfunction. For this reason, together with the experts, we developed Liver Dr to address these important health needs. Liver Dr is a 100% herbal remedy containing herbs known for their ability to improve the functioning of the liver and protect it from damaging toxins and disease, thereby improving overall systemic health. Apart from their beneficial effect on the liver, the herbs chosen for Liver Dr also have other important therapeutic benefits, which further contribute to a healthy body and better quality of life. Silybum marianus (Milk Thistle) This herb has been used since ancient times for treating a wide variety of ailments but particularly liver problems. Milk Thistle is widely prescribed for preventing and treating liver disorders including viral hepatitis and liver disease associated with long-term alcohol usage. Studies suggest that this herb protects the liver from damage by viruses and toxins including alcohol and drugs and is widely used for treating Hepatitis C. Milk Thistle is also a potent antioxidant and laboratory studies indicate it may have useful anti-cancer properties. Taraxacum officinale More commonly known as Dandelion, this herbal ingredient contains bitter principles which have a beneficial effect on the liver and digestive system. It is considered a very effective general tonic and is known to improve bile flow and reduce inflammation associated with hepatitis and cirrhosis. Dandelion also improves gall bladder functioning and helps to dissipate gallstones. Dandelion is a rich source of vitamins and minerals, including Vitamin A, D, C, various B Vitamins, iron, lecithin, silicon, potassium, magnesium, zinc and manganese. Verbena officinalis Also known as Vervain or Wild Hyssop, this herb is native to the Mediterranean region. Used as a hepatic (liver) remedy, it will treat inflammation of the gallbladder and is also used for jaundice. It is well-known for its ability to relax tension and stress and relieve mild depression. Liver Dr. contains no animal products, gluten, artificial flavours, colours or preservatives. 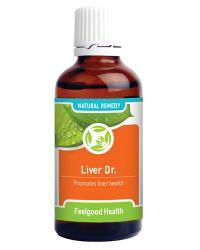 Liver Dr. comes in convenient tincture form and is diluted in water or juice. Adults: Dilute 15 drops in about 1/4 cup water or juice three times daily. Children over 6: One drop per age year in 1/4 cup of water or juice three times daily. Caution: Safety during pregnancy and breastfeeding has not been established. NOTE: Use together with Immunity Plus for viral infections of the liver and/or Fatigue Fighter for chronic fatigue conditions. It is recommended that people with diabetes use Liver Dr. along with Insulate Plus and Triple Complex Diabetonic. With regular use, results should be noticed within 3 - 6 weeks, although some people may respond sooner. You should begin to feel more energetic, notice improved digestion and a greater sense of well-being. By far the most important results, however, will remain ‘unseen’, as Liver Dr silently and effectively works to protect and condition the liver to achieve optimum health. One bottle of Liver Dr. should last 3 - 4 weeks. Avoid alcohol completely if you have any liver problems. Be very careful of using any prescription or over-the-counter medications. Liver disease can make you very susceptible to the adverse effects of medications. Even seemingly safe medications like paracetamol can be extremely toxic and damaging to the liver. Avoid eating raw shellfish. These can harbor bacteria that cause severe infections in people with liver disease. Hang-Over Morning Mend + Detox Drops + Liver Dr. Morning After Pack: Soothe hangover symptoms, detox the body and assist the Liver! Epi-Still + Triple Complex Nerve Tonic + Liver Dr.
Seizure control remedy plus nervous system and Liver support!